Search Engine Optimization is something that very few webmasters can avoid in today’s day and age. Everybody wants to get to the top of the search rankings, but not everyone is willing to put in the time and effort that it requires. People who are new to SEO often end up trying every technique that they find to see if their website goes up in the rankings. But there is a clear distinction when it comes to what is acceptable and unacceptable in the world of SEO. There are some practices which are ethical and unethical. Being on the right side is very important. The better the information you provide, the better it is for you in the long run. Search engines are always improving their algorithms to detect the best content for each keyword out there. If you end up creating quality content without thinking about which keywords to rank for, you will end up ranking for a number of keywords automatically. Then you can work to improve your ranking for those keywords by writing on niche topics related to that keyword. The more content you generate, the higher the chances for you to go up in the rankings. At the end of the day, if you look at the top ranked sites across any market, you will find that the best ones have great content, be it video, infographics, etc. that are loved by their users. Is your website multimedia friendly? Is your URL trimmed and short? Have you ensured that your site is loading on time? These are the questions that you need to answer before you go ahead to the next steps in your SEO campaign.You need to ensure that you have optimized your website for proper indexing by search bots. You should have used Schema markup. You should have all the title tags, image tags in place. All your image sizes must be optimized and social sharing buttons must be in place. Your web pages must be interlinked and the navigation must be up to the mark. You can be sure you are on the right track when you have followed all the rules in the Google Webmaster Guidelines. When you have a website that not only has great content; but great navigation, UI and overall design, your users are happy at the end of the day. This is what search engines like Google expect you to provide to your users. When they go through your analytics and see that you have been able to hold the user’s attention and able to satisfy them, it becomes the greatest sign of approval for your website. Google collects all kinds of data from your website. You can find it on your Google Analytics page and also see how Google is viewing your website in the Google Search Console. From the traffic you are generating, to the number of pages they are visiting, to bounce rates, to the time spent on each page; every metric is an indicator of the value of your website. The better your metrics are, the higher ranking you can expect. To be a website with authority, you should have a number of trustworthy websites linking back to you. 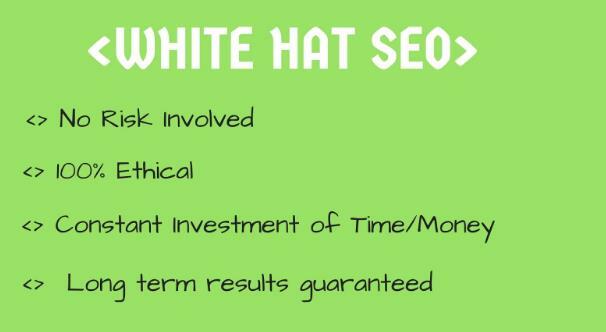 In White Hat SEO, webmasters do this the right way by guest blogging. They do this by actually spending a lot of time in researching and creating valuable information that is beneficial to users. Then they become an authority in that subject and slowly various news and industry publications invite them to write about a specific market or niche. This happens only if they keep posting great content consistently for a long period of time. Trying to find shortcuts won’t work. If you persevere, you will have the best compared to your competitors, which will automatically push your website above your competitor’s. You don’t wait for people to invite you, instead, you should go ahead and write on different blogging platforms and interact with your potential users and proactively answer their questions on platforms like Medium, Ask.com, and Quora thereby naturally increasing your reach. This is one thing you are encouraged by most SEO experts. The one who is able to do this the best is able to earn rich dividends. Spend time researching and finding the best keywords that you want to rank for. Find niche topics that you can write about using these keywords. With Latent Semantic Indexing, Google can easily figure out what you are writing about, so you don’t need to make the mistake of repeating your keywords number of times. Just ensure that you are marketing your posts well so that it reaches the right audience. With the right keywords at your side, you can beat your competition in a fair manner. It’s all about using data and some creativity to find ways to fairly rank for certain keywords that are key to your marketplace. This makes it an equal battlefield for all and the smartest people have the most chances of beating the competition and ranking on top. SEO beginners are under the misconception that they can get an easy backlink by just going ahead and commenting on different websites/forums. You may have seen hundreds of blog posts that have comments like, “Please try out xyzabc.com, its one of the best products in the market.” Avoid user-generated spam, be it the comments section or in the forums. It will only harm your prospects when it comes to the long-term goal of a high search engine ranking. Well, the sad truth is that links that you get using these methods are categorized as ‘nofollow’ links by search bots, so you end up getting no benefit from it. Also now there are tools available now that do comment spamming for you. The best thing you can do is stay away from all such tools. You will only end up increasing your chances of being penalized by Google. Duplicate content is a cancer that has affected the free web. Anyone can access information and then rewrite it and publish it without giving credit. But some go even to the extent of scraping pieces of content from other pages and directly pasting on their web pages without their permission. This is basically stealing information. They use it get hold of users who are searching for that information and get them to their website to sell them a product or a service. It is acceptable that you use really good posts as a starting point to write your posts. But using content spinning softwares that paraphrase your desired content is a crime. You can hide for some time, but then it will not be too long before search engines catch up to you. In the quest to building up a huge quantity of content on their website, many webmasters rely on this Grey Hat technique, but they cannot escape the penalties that are awaiting them. This is a classic technique that has been used shamelessly by many webmasters for short-term gain. You know that your web page will not be able to rank for most of the keywords in its market because of the high competition. So, what you do is create a web page about a niche topic that people are searching for. When the traffic starts to come in, then you change the content of the page to display products/services that you want to sell. These type of sneaky redirects are extremely risky to the wellbeing of your website. Imagine that users come to your website looking for a specific thing and have to exit the page immediately as they can’t find it. This leads to a high bounce rate that could alert the search engines. But webmasters still indulge in this practice in the hope of a small percentage of conversions in a short span of time. This is not advisable and can lead to a major penalty by search engines. Getting social media followers in this day and age is a very difficult task. To build their reputation on social media channels, webmasters may end up buying followers, likes and retweets on their social media posts to show search engines that there is a lot of social media activity that is going on. They hope this will end up being a positive signal in their favor when it comes to judging the value of the website. Now there are tools that can automatically follow you from 1000’s of accounts. Well, we all know how social authority is becoming a big factor in search engines like Google to rank websites. But, search engines have not yet been able to figure out yet, but soon they will be able to track social media data accurately and penalize webmasters who indulge in such activities. Footer links are designed to help users move around the website easily and find what they are looking for. But a lot of webmasters use this space to improve their rankings by adding keyword rich anchor texts. Google says that you are supposed to put a ‘nofollow’ tag on them. But when it comes to Google’s guidelines, some prefer to avoid it to get to the top as soon as possible. Only if you are 100% sure that this link will be beneficial to users, put it there. Otherwise, you are only increasing your chances for a penalty. Usually, Google doesn’t pay much attention to footer links. But since Google has mentioned it in the Google Webmaster guidelines, that you are supposed to do it a certain way, you have no choice but obey the rules to stay safe from penalties in the future. The most common practice that every beginner to SEO is guilty of committing. Everyone blatantly practiced keyword stuffing a few years back, but its practice has become rare today. It is true that webmasters still try to place keywords at specific intervals, but search engines have become too smart to detect that and more. Only the natural style of blogging works in 2017. Keyword stuffing is not limited to titles; webmasters put it in meta tags, anchor text and image Alt text. Search engines are extremely effective in detecting if you have been involved in stuffing keywords that are not relevant and will definitely penalize you. Anyway, stuffing keywords is not going to benefit you anymore when it comes to on-page SEO, so it is better if you avoid doing it. When a user steps into your website, you get an opportunity to interact with him both positively and negatively. If you indulge in negative practices like changing the user’s search preferences, installing a virus on their computer, or downloading a file to their system without their permission, you are going against the Google Webmaster Guidelines. You are 100% sure to be penalized. 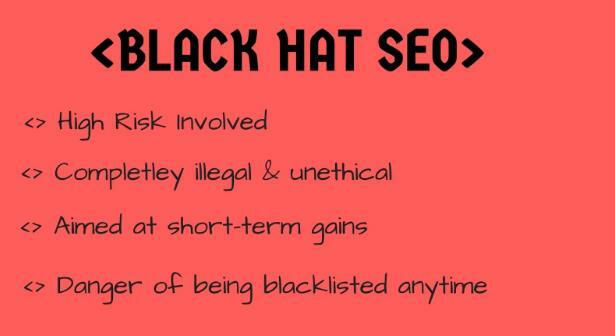 Many Black Hat SEO practitioners indulge in practices like swapping ads, making your click on one page and show it as another, steal your personal information etc. This lets them manipulate a lot of statistics in their favor to get a better ranking while giving a hard time to the users. Google is against these practices and has banned a number of sites which practice these techniques. Now, when you have a flash website that takes time to load; Google recommends you to create an HTML version of it. But few webmasters like to play hide and seek with the search engines by showing one piece of information to the search engines and a different one to the users. They deploy a program to detect if it is a human or if it is a search engine that is visiting their site and changes the content accordingly. This is called cloaking and it is purely a Black Hat SEO technique. There is no such thing as White Hat cloaking. So let no one trick you to believe that. Google has clearly stated that any website indulging in cloaking is in violation of its quality guidelines. There are a lot of domains out there on the verge of expiry, they might have a keyword in their URL that you are looking for or still may be a source of decent source of traffic. So, many Black Hat SEO practitioners buy these domains in auctions.They expect to fool Googlebot into believing that they have shifted from a old domain to a new one and thus give the new website the amount of trust that the old website enjoyed previously. Also getting the traffic from it is a big plus. When it comes to backlinks also, old domains become really helpful for webmasters to manipulate their authority so as to trick search engines. This was a very successful technique a few years back. But now Google has the ability to find out if you are faking it or if the old domain really belonged to you all along. If you try this in 2017, you will be penalized within a few days. Search engines like Google scrutinize your links regularly to check if you are indulging in illegal practices. But webmasters are always ready to take a risk. Some of them used to indulge in a practice called link farms, where they created web properties that linked to each other thereby passing on the PageRank juice to the main site. Soon this process even became automated and people could use it with a click of a button. A number of link schemes have been used as part of Black Hat SEO over the years, one of the most popular being submitting a website to a number of low quality bookmarking sites and directories. Even when you go ahead to link an external website and request for a backlink in return, Google sees it suspiciously. A website could be penalized if this happens multiple times in a short period of time. Now there are also automated link creating programs that promise you a large number of high-quality links immediately. But any form of buying or selling links cannot miss the scrutiny of Google anymore. Even excessive guest posting will bring you on the radar of Google. You are bound to be penalized for sure and may end up having to start from scratch all over again. 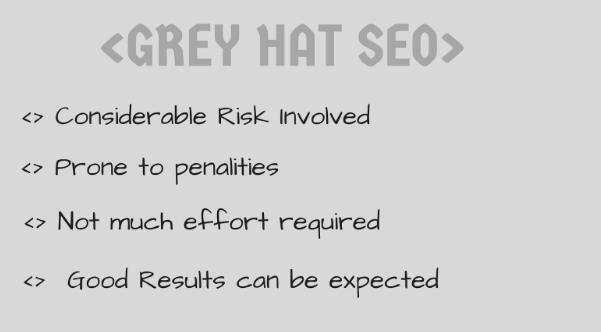 When it comes to the temptation of trying Black Hat SEO or even Grey Hat SEO, you should read about brands and organizations who have tried this and lost millions of dollars because of penalties by Google. There is no shortcut in achieving a great search ranking position. It is like building a brand, it takes time and effort. If you try to use any unnatural method to get ahead, you may end up sabotaging all the effort you have put in so far. So stay aware and away from the shortcuts that are so tempting. Be on the right side of the rules and play fair to get to the top. In the long run, you will get back 200% more than whatever effort you have invested in all these years. What are the Major Search Engines other than Google?